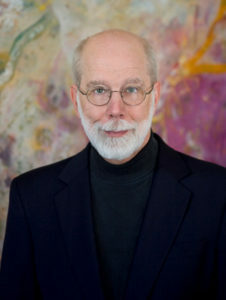 Bruce Stevens has received accolades for his “artistic organ playing” in which “discretion, cleanness, clarity, and stylistic awareness are tempered by purely musical values…one of the few who is able to achieve expressivity in the romantic sense via agogic stresses and to do it without sentimentality.” (American Record Guide, 9/10, 2001) He is active as a recitalist in the U.S. and Europe and has performed recitals for 21 annual national conventions of the Organ Historical Society, for several regional conventions of the American Guild of Organists, and for national conventions of the American Institute of Organbuilders. After receiving music degrees from the University of Richmond and the University of Illinois, he moved to Europe for three years of organ study, first in Copenhagen with Finn Viderø and Grethe Krogh and then in Vienna with Anton Heiller. Mr. Stevens was a finalist in the AGO organ performance competition as well as in other competitions held in Los Angeles and Fort Wayne. He has recorded seven discs for Raven Recordings, including a series of CDs devoted to Josef Rheinberger’s organ sonatas played on various historic American organs. He is Instructor of Organ at the University of Richmond and director of Historic Organ Study Tours (HOST), which he founded to further the study of historic organs throughout Europe.